A Wrapunzel classic, our New York Brights Scarves are the ultimate versatile staple for your wardrobe! 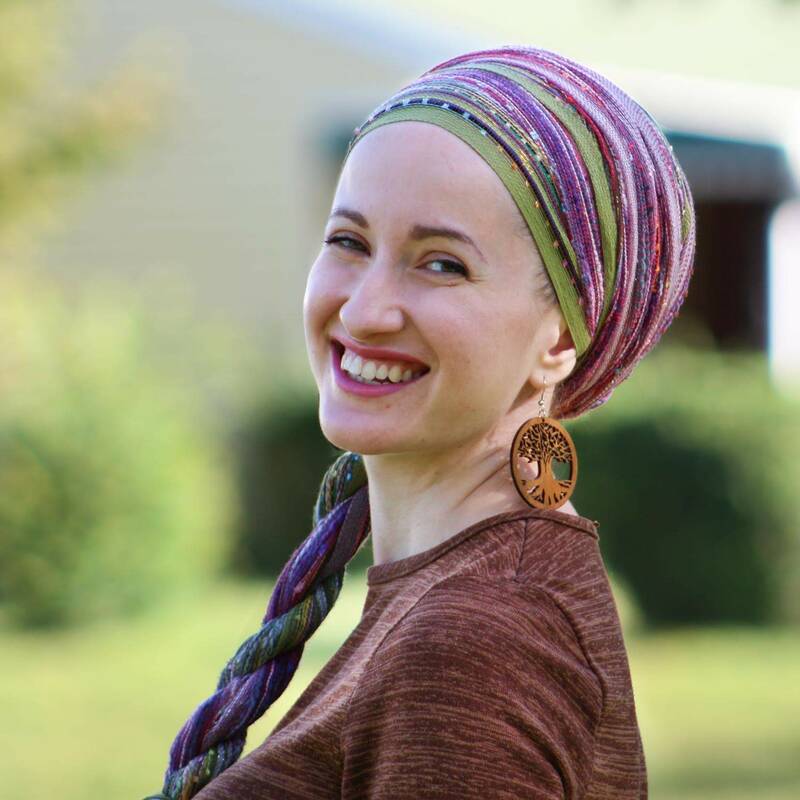 Their subtle striped and textured look is ideal for making one-scarf wraps look fancy and complex without any effort on your part – try them in a turban or Yael Twist for a gorgeous look! 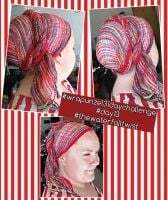 Since they’re thin and a bit translucent, they work best with a shaper or base scarf underneath if you need full coverage. They’re also amazing for bulk-free layering since they’re so light. 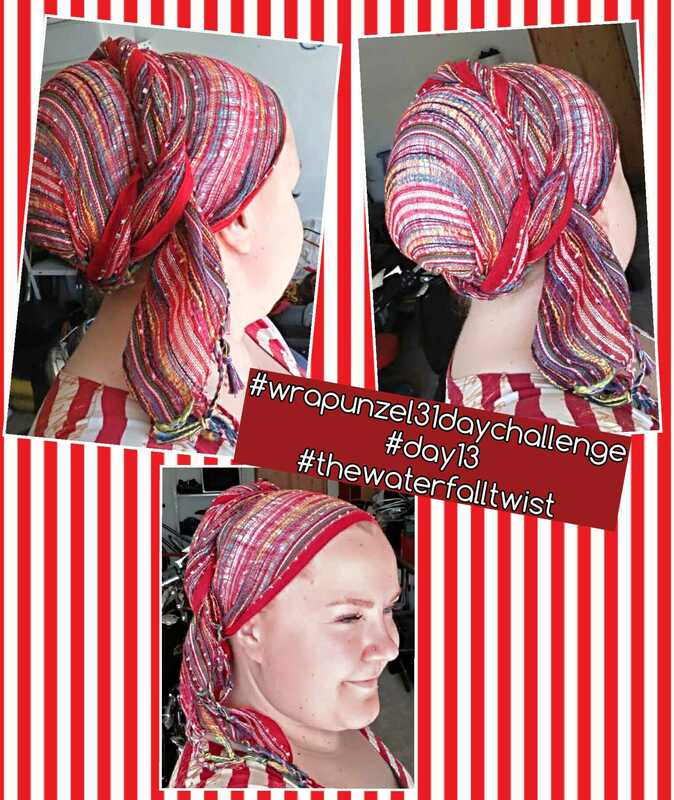 Try wrapping them with a contrasting or complimentary Original 2 in 1 if you want to try out a two-scarf look without too much weight! 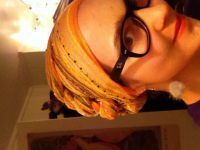 This is the first time I decided to use my New York Brights scarf as a full wrap instead of a head band. 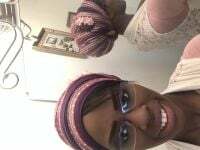 I paired my NYB in Maroon with a plum pashmina. I love the colors! I love my Olive NYB. I may have to get more colors! I wear this one over my apple green solid pashmina and the combination is just beautiful. 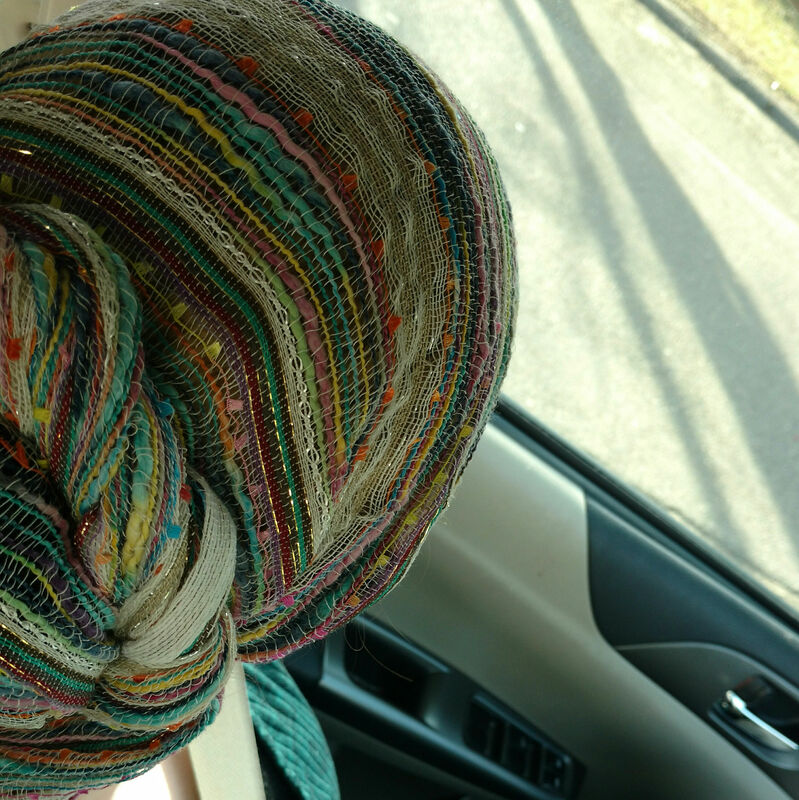 It’s lightweight, colorful, and something about the texture makes it super grippy. Which means that the knot stays just as tight as when I first tied my wrap until I intentionally untie it. Exactly what I needed! Dear Wrapunzel, congratulations on your first five years. I wish you many many more! In search of NYB, I’ve found Wrapunzel. This was the only scarf I couldn’t find in my Holy City of Tichels. When I bought my first NYB, someone told me it was going to be addictive. Yes, NYB is the highly addictive scarf, I’d say. One of my favorites to fold in and layer! It’s so lightweight and thin that it doesn’t add bulk, so it goes with everything. I’m wearing it in Olive with 2 Tuffs. The olive has little specks of blue, pink, yellow, and purple. 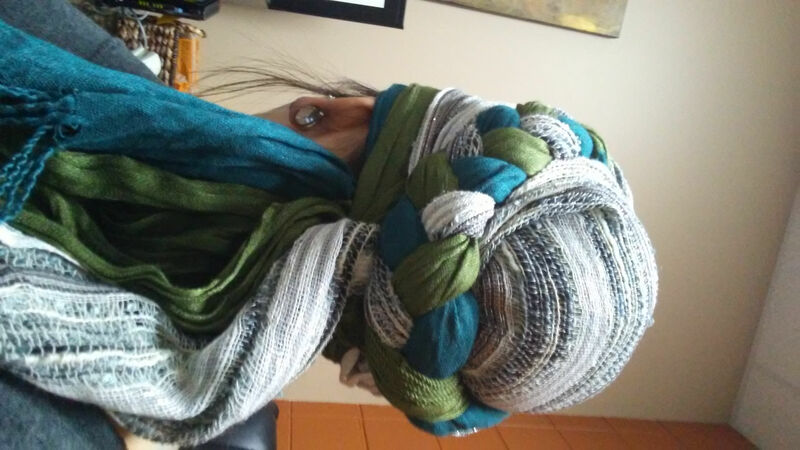 The only downside is that it is shorter than Tuffs, so you can see in the end of the braid it doesn’t quite make it with the others, but I resolve that by fanning out the longest tail around the others to try and hide it. There’s also a little secret sparkle that shines through from under the top Tuff in daylight! Again me, this time it is the dark red NYB. 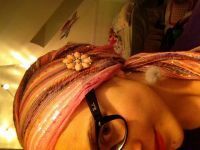 I wear it together with the golden roses headband and the israeli tichel in burgundy. As this one is sold out right now, I will pass it on to my dear friend who is in love with it. Hope they come back in more colours again, I still need the savage green. It must be the pattern and how easy it is to wrap that makes them so Special. I love it how the second scarf peeps through it with its colour. It is so light, the possibilities are endless. I ordered this scarf in a lot of colours! Today I am wearing the Grey NYB together with a teal tuff 2in1. 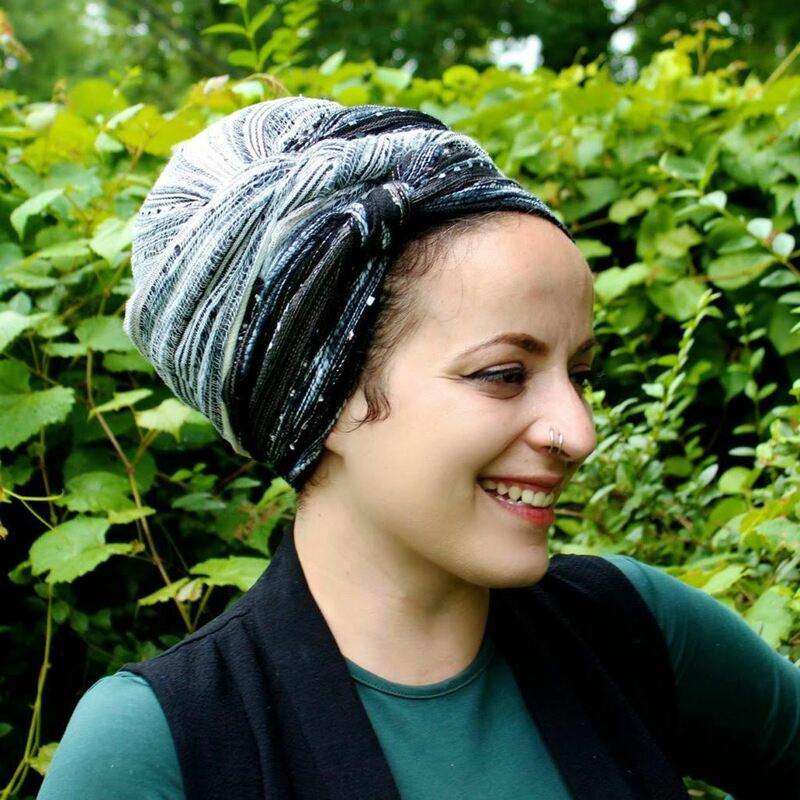 If you want to build up a scarf collection and like the colourful and glittery features of this wonderful scarf, you should get them in all the colours you like before they are sold out. I am sure you will wear them a lot. After buying one, within a year, I now have 6 different colors to play with. I have soo many pics to post on my review but have no idea which one! They are fun and easy to play with! My two daughters(9 and 3) love these. Thank you Wrapunzel for continuing to make them available! Very pretty. This was my very first purchase with this company and the scarves did not disappoint. I got the white/black and the cream one (t has lots of shades of brown w/sparkly gold). I wasn’t sure about the cream one when I saw it in the package, but I pulled it out and it was nicer than I thought. I should have gotten more when they were on sale. Very light weight. Haven’t wrapped with them yet, but I know they are going to look fabulous. as I had long dreadlocks for a decade which made it impossible to live completely tzniut and honestly I wanted too but was afraid I wouldn’t be pretty. Wrapunzel has surely helped me with that. I feel free and more beautiful than ever. Especially since I know I am beautiful in the eyes of my Creator HaShem. Whatever your reason for wrapping Wrapunzel has you covered. I got the maroon one and it is very berriesh, I like that! It is my first woven scarf and I need to practise but it’s worth it. And they look awesome, no matter how I wrap them. Here is maroon with a burgundy israeli tichel. what can I say?! the pictures are beautiful but they do not do these scarves justice. they are more beautiful in person!! The New York Brights are fantastic! I live in Florida and in the summer it is very humid and it’s hard to find something that I can wear and still be cool. These work! I have one right now, the brown with color and I love it. I may have to have every color available! Thanks Wrapunzel! I’ve got the burnt orange one and I like it so well I’m going to buy at least two more colors. It holds as securely as a rubber band and is very pretty. Good for mixing with solid scarves too. What amazing things can I say that haven’t already been said?! These scarves or amazing layers, sashes, and even alone. Loved them through winter and I feel like they will be my live in for summer! That first pic of Rachel ( I think) wearing the two NYB’s in black and white, I would love a tutorial for that style!! Does this scarf need anymore reviews ? 🙂 I just wanted to say how surprised I was at how much I like them and how well I like my gray with color NYB paired to a mulberry shimmery ! Previously I got this one in pink, but now I have a yellow one! It reminds me of a cute little bumblebee trying to be fierce! I like it; it reminds me that little things can be strong. A plus is that if you stab it with a pin…or your glasses…and create a hole, it’s VERY easy to fix by moving the threads back into place, since it has a loose weave. I’d recommend a white shaper as opposed to a black one, because for some reason it’s less noticeable if it shows through. 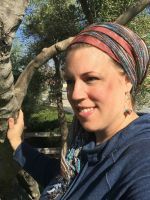 Overall, I love how fun these scarves are; they work as a one-scarf wonder or a layering piece, and either way look like tons of effort, but are so easy! I had to make my Wendy smaller for this scarf, because of its small width, but it gives a very fun, lighthearted look! I like how it’s sparkly and has different colors in it. I think it will be very good for adding texture to other wraps, maybe adding a pop of color layered over a more subdued solid. I ordered a brown with color to start my neutral collection. I get washed out in Brown so ideas hoping the colors would help. Boy, was I totally right!! This scarf is awesome. ITS very light and airy. Perfectly pair with MANY scarves. I have even worn it with no shaper and it looked great ( my hair is shoulder length) it work with the very littlw volume I had from my hair and the ooopftatsic scrunchy. This is one of my favorite scarves. Oh.. mine had a small manufactor defeat but nothing that compromises function and the ladies at wrapunzel were great and gave me store credit to spend o my next purchase due to the error. If you’ve never been to New York, owning one of these scarves is a small taste of the Big Apple! So much diversity, pizazz and excitement all in one scarf. With the variations of colors woven into each different shade, there are endless possibilities. It has just the right amount of shine as well with its metallic threading perfectly sewn in. I have not encountered a type of scarf that I cannot pair the New York brights with and have it come out totally fabulous. Ladies, this scarf is a stunning and fun addition to your established collection or an amazing start to your budding scarf stash! 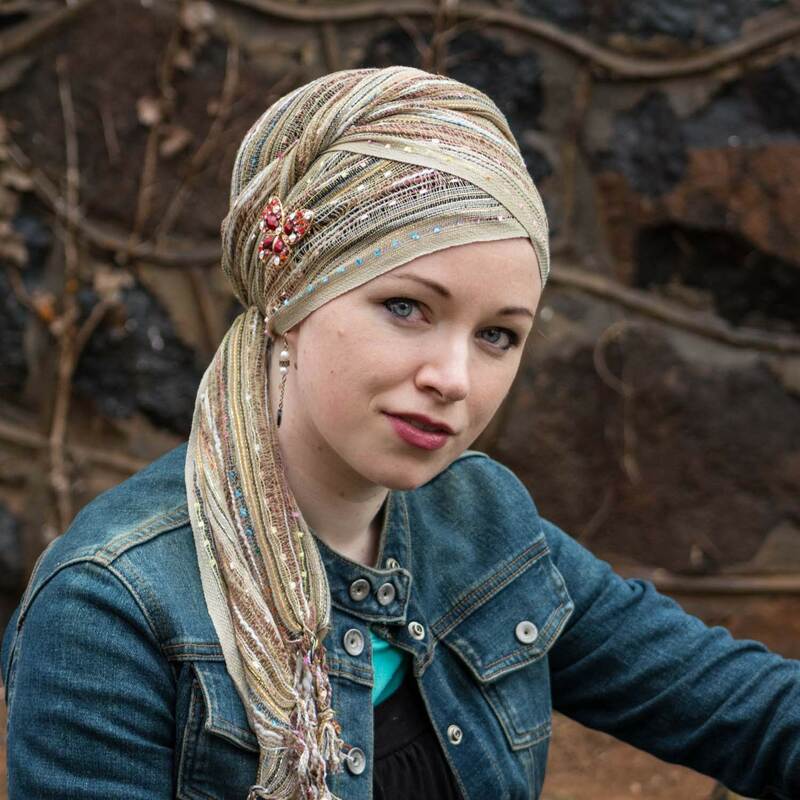 This scarf will make your wrap the talk of the town! Oh, the colors!!!!! How do I even start to sing the praises of these wonderfully versatile scarves? 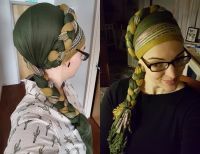 Soft – easy to wrap – they go with everything and anything and can totally transform a wrap into something elevated and ethereal. It’s been hard to decide what colors to buy, so I’m gradually collecting them a scarf or two at a time. There is nothing like the mix of colors, sparkle, and texture that these scarves give! 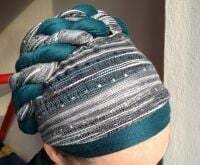 When you twist it with another scarf, it looks fantastic! I fully understand why every Wrapunzelista I know has at least one of these–their texture is so interesting, and just a hint of sparkle for a dressy-casual look. I gave a 4 instead of a 5 because you have to be careful not to snag the ends, where the loose weave comes into the tassels. But for those who wear mostly up-styles, without tails, this would not be an issue at all. I have 3 of these and 2 more waiting to be ordered as soon as I get paid. They are fun, colourful, and cool. I wore just one over my Signature shaper last night, in fact. They are super grippy – which means once they’re on you pretty much don’t have to worry about a thing. They don’t want to leave your head! And I am a fan of how it “spices up” a colour. If you’re like me and wear a lot of solids, this is a great way to introduce a little something extra. But, the NYB Scarf is not without faults. It’s a small scarf, so check the dimensions listed. It takes a lot of carefully placed effort for me to get away with wearing JUST this scarf. Also, and this is a personal preference, the tassels at the end are thick. This isn’t so bad if you’re wearing tails, but if you’re trying to layer and tuck, these can look very lumpy and be very uncomfortable easily. I would give anything for this scarf to be a few inches wider, and not have those awful tassels, but even as is, I still enjoy this scarf immensely. I bought “white with color” although there wasn’t a picture of it available. It’s gorgeous! It is much more color than white, and matches everything and nothing at the same time. The metallic threads give it pop in the sunlight and the tassels with multiple colors braided together are such a fun look. I just got my first New York Brights scarves in the mail (and 2 days early!) I ordered them in olive, and pink. These scarves are amazing! I was initially worried that they would be too narrow to work as an actual wrap -as opposed to a sash- over my Wendy shapers, but they work out great (note: I keep my Wendy shapers stuffed 2/3 full…). I love the scarf. 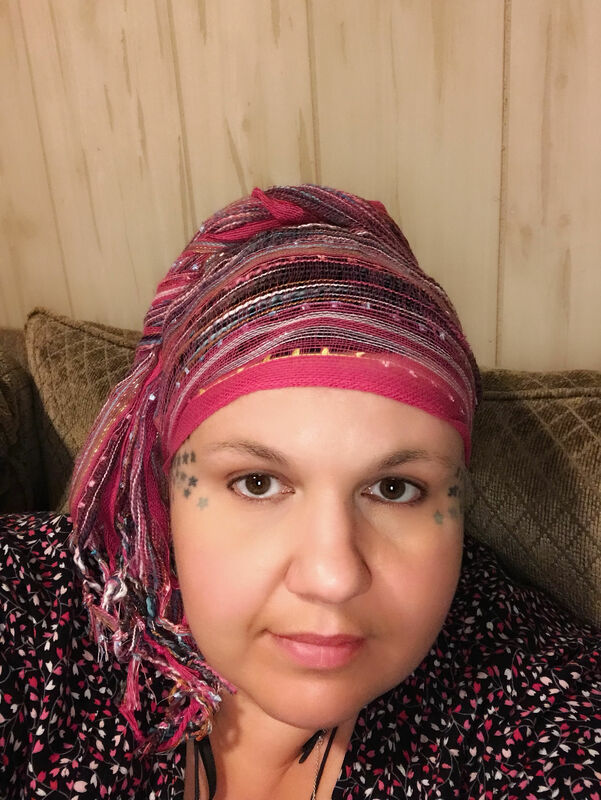 I’m new to covering my head and wish were just a little wider. I do have one question though, lot basic scarf should I use under it? I have the golden tan color New York Brights. Thank you so much. 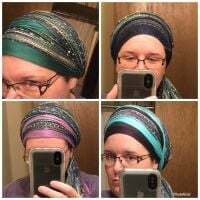 I have to say these are so beautiful and are my favorite way to add some sparkle and color to any wrap. 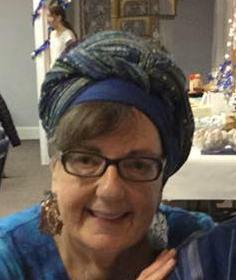 The little silver and gold threads are so tastefully placed and the variety of colors in the scarf show up like little satin gems. They are just right! How can someone love a scarf so much? You will just have to get one and you will see, they are strong and hold up to being tied and twisted and then lay right back into what ever way you want it. This scarf is wonderful! Lots of color and sparkles on the threads. I have this in orange and blue. I love pairing them with different 2 in 1’s or my feathersoft. 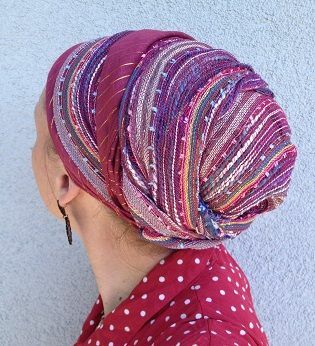 They add so much color to solid neutral wraps. They are easy to snag on things though, so be careful with them. I love the NY Brights, I have a brown/earth tones and a lavender ones. Use them for a head scarf and a neck scarf as well! How can you not love a New York Brights? My favorite part is the texture. 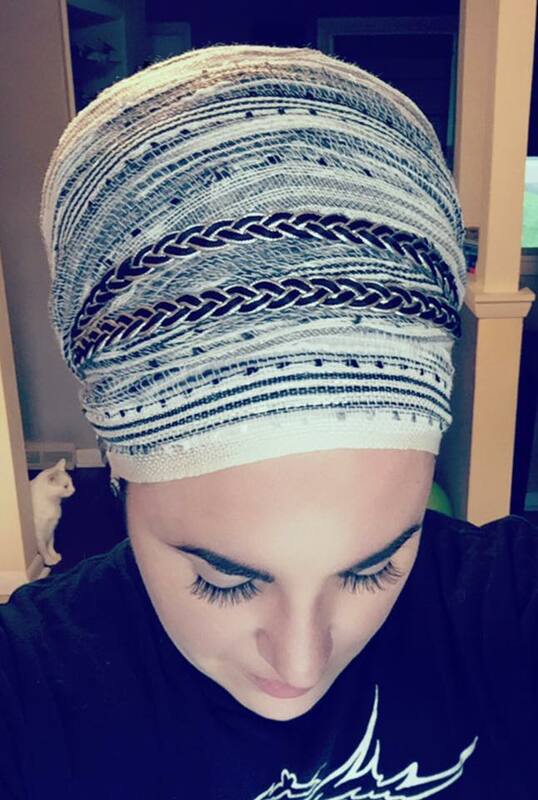 It makes the simplest wrap look intricate and georgeois without a ton of time and effort. Plus the texture keeps it in place all day. Love!!!! Everytime I saw someone with this scarf, I had to have it! It is a little shorter than other scarves, but it looks intricate with so little work. I’d like some more colors. They do match things so easily. This one is brown with color. 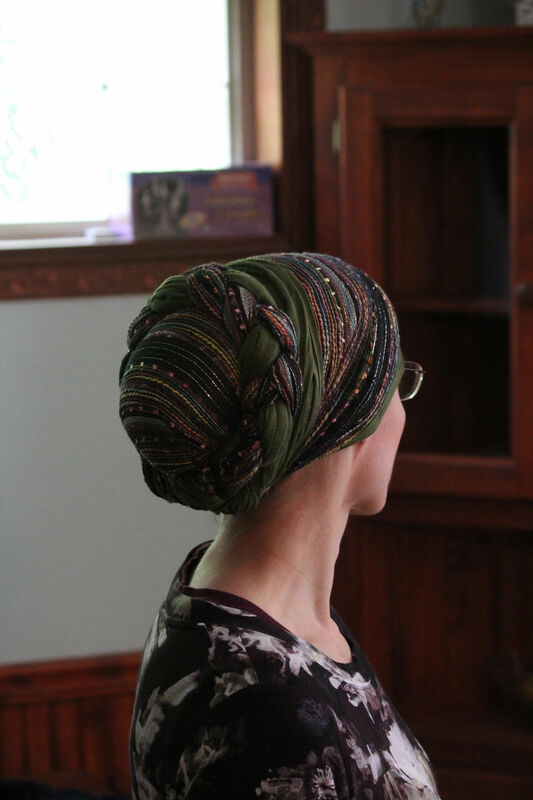 The NYB is very versatile so you can wear it on its own with a shaper or mix it with other scarves. With the many colors in one scarf you can match it to any outfit really! I’m wearing the red one in the photo. I love my New York Brights. For women like me, who often wear one scarf only, the NYBs are a dream! 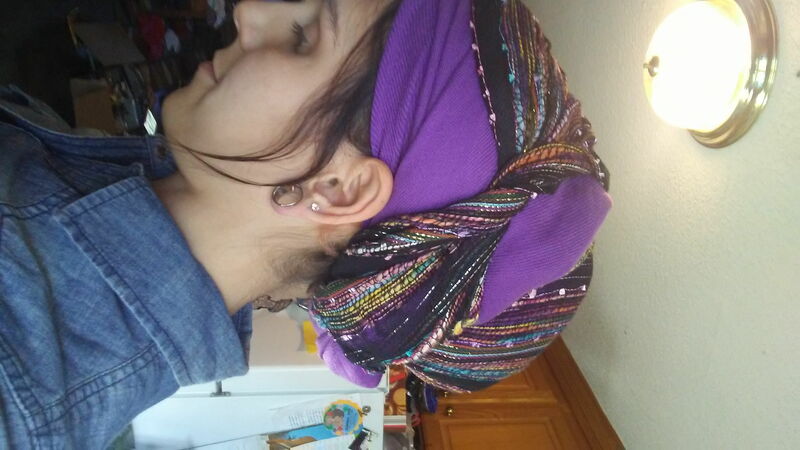 They have texture, so they stay put, and they make for a great turban. Colorful, cool (because of the weave) and they stay put—-perfect for summer! These scarves are all about colors – mixes of beautiful colors – so my favorites might surprise you. Personally my favorite New York Brights are the black/white and white/black. 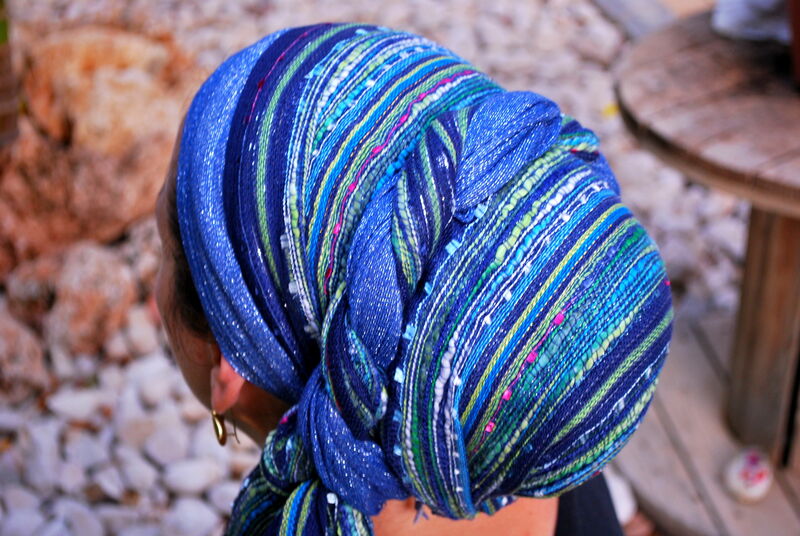 You can dress up any solid colored scarf easily by pairing one of these with it in a two-scarf wrap. In my opinion the black/white and white/black ones are staples that every woman should have. 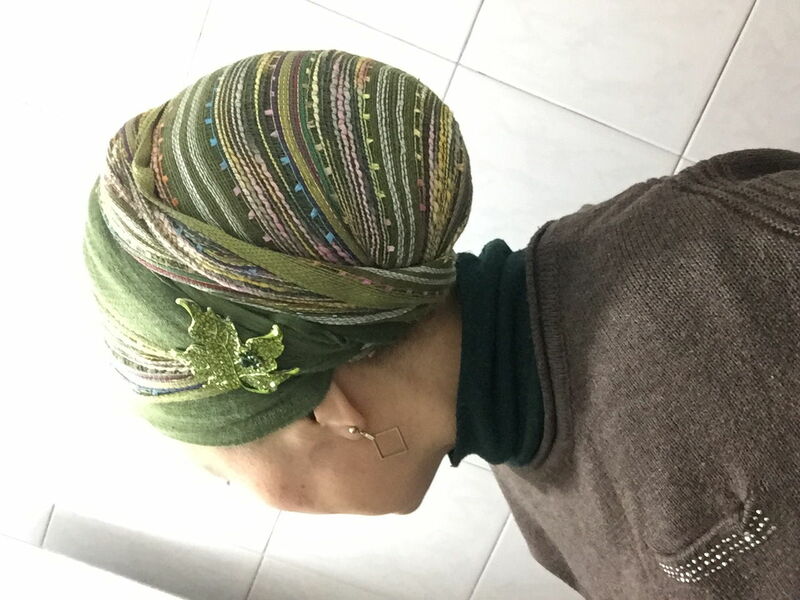 Their textures and the silver threads running through them add a lot of interest when they are paired with a solid colored scarf, and they go with any color. Or they can even be worn alone and look lovely. Perfection. I have two of the New York Brights scarves from Wrapunzel (White with Colour, and Black & White), and I have two similar scarves from a department store. Buy the ones from Wrapunzel. The quality, texture and durability are all much better than the department store ones. The Wrapunzel ones are much harder to snag. The quality is outstanding. I am going to order more of these in other colours. as these have quickly become a “go-to” favourite scarf. They spruce up any outfit. I want to apologize to the person that wrote in saying that these scarves were acrylic, while the ones I had were rayon. I just bought another color, and it is indeed acrylic. Apparently, some colors are one fabric and some are the other, but they are all beautiful. I am wearing one right now. These are even more beautiful in person than on the computer screen. I have several, and I love them all. FYI, these are not acrylic, as someone commented. They are 100% rayon and are not scratchy at all. These are beautiful! They pull colors together very well. They’re bright and light and they look happy. I get compliments every time a wear a New York Brights. You really can’t go wrong with these scarves! I bought the navy and red in this scarf. They have become my favorite and “go to” scarves. I am pretty new to covering and I am terrible at wrapping. 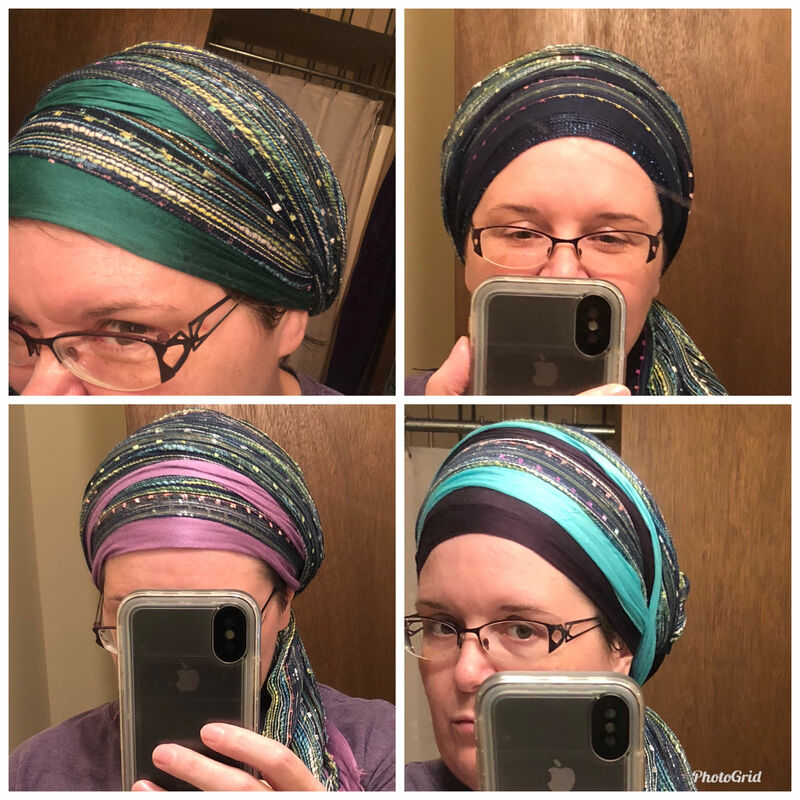 I also have an unusually large head (I always thought it was normal until I started covering) so the scarves are not quite long enough to even do the regal wrap. I’ve also found I don’t look good in a solid. So I’ve been using the NY Brights by themselves. They seem to go with everything. I can’t wait for the stock to be replenished so I can order more colors. This scarf is okay. 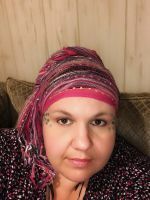 The fabric is a little scratchy on my skin and is not very wide, so I almost always have to wear it with another scarf. I am not a huge fan of acrylic, but it’s not too bad. I love the vibrant color (I ordered the reddish-orange). 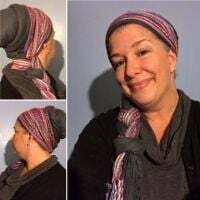 These scarves aren’t very wide, so if you have a big head and wear a big shaper, you might not be able to wear them on their own because there might be part of the shaper showing in the back. But because of the slightly see-through structure of the fabric they might be better for layering anyway if you don’t want the shaper to show through the scarve. I have had these sense they first came out, and have added just about all the colours as they came out. This is great over a plain scarf or as an accent, can be folded into a sash or just about any way you want to wear it. Also nice and thin for summer wear. I have to say, at first I was a bit hesitant towards my brown NYB but I quickly noticed that it layered quite nicely. Thin and yet it feels so durable. Very nice. I think I will be purchasing more in the future. You can’t get wrong with a NYB! 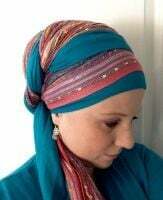 They fit every pashmina, layer very well, and match all patterns on dresses or shirts. They always look great! I love them! Would you say that someone who owns 7 NYB’s and is planning on adding more to her collection loves these scarves? …….. You betcha!!! I have white, pink. purple, dark red, orange, navy & brown so far. And I LOVE them!!!!! They are sooo easy to wrap and the effect is stunning. 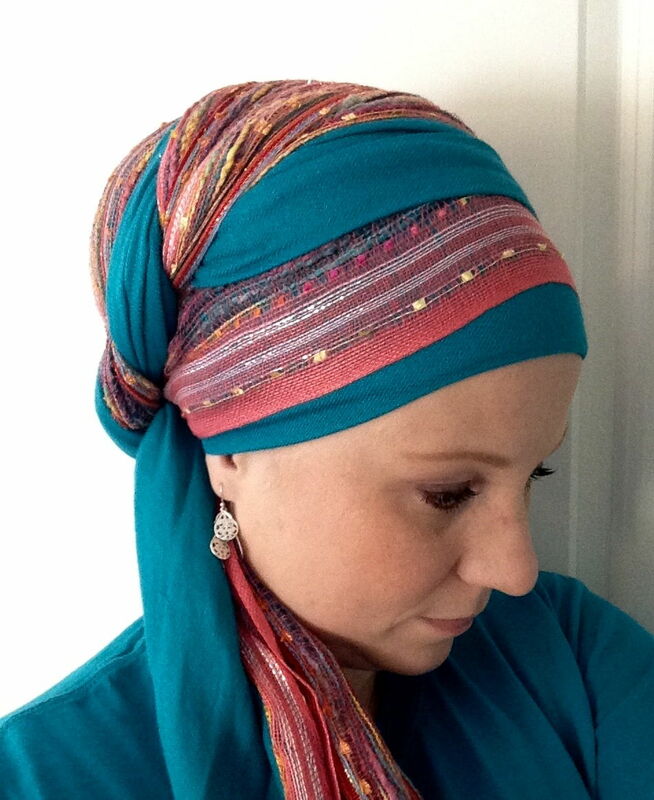 An NYB can transform a solid colour pashmina into a bright & brilliant wrap in seconds. Or a 2 in 1, depending on the season. Second Scarf, Sash, Accent ….. whatever way it is worn it will transform your tichel to perfect! I want MORE!!!! I bought the purple scarf. It is absolutely beautiful! It does not look cheap at all and the material is tougher than it looks. When I wore it, along with the black tear drop earrings, my husband said I look like a “forbidden princess. If he touched me the king might get him” 🙂 Thanks for providing us with such beautiful scarves. My blue NYB is a treasure! I have dark hair so don’t need an underscarf, the most I’ve used is a navy headband at the front. 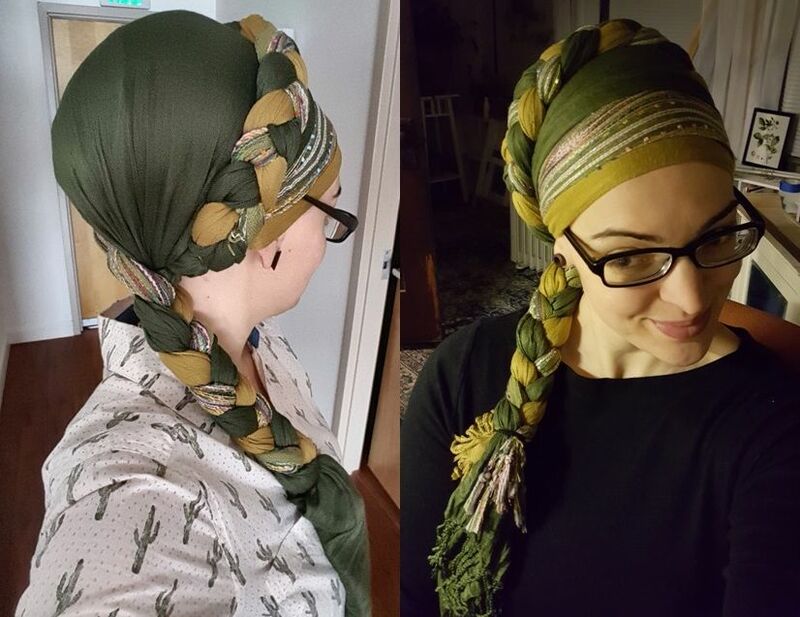 I had happened to buy a seafoam green 2-in-1 at the same time, so tried to see if I could manage two scarves yet (I have short hair and “bad hands”. Well, I couldn’t manage two scarves, but I realised how well the seafoom green actually matched the marine theme of the NYB and one of these days, I WILL be wearing both together! I got my first one with the “tangerine dream”, and I quickly noticed that it can go with a lot af tichels combos to make them pop! the kit contained the yellow one, and I definitly fall in love with this colour I thought I could never wear it! But it’s like having a sunbeam on your head, and you carry it through the day and spread it around you where ever you’re going! 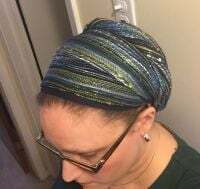 Definitly “teaching colour” with a great tichel which offers tons of possibilities! I got this one in colorful grey with the plan to pair it with a black and white tichel I’ve had for years and never really liked much by itself. With all the colors, I knew I could pair it with other tichels as well, but it was the black and white one that I had in mind when I picked this scarf. The picture doesn’t do it justice. It’s simply gorgeous, and the colors are flecked throughout. It has a wonderful texture but is soft and easy to handle. When I paired it with the so-so tichel I already had, the result is so great that I think I’ll be wearing this pair a ton (admittedly, the so-so one is barely showing, which is why the result looks so good! ), and I can also pair it with all sorts of other tichels. It’s so pretty and versatile that I think I’ll get more in other colors so I can play around with all the possibilities. 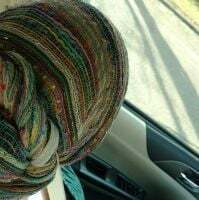 I LOVE the colors, the texture, the fact that they are so lightweight…I usually wear them as a sash but recently tried using it as a full cover since it’s so hot out- it worked beautifully!! I have four different colors…but I want a brown one, too!! I have both a pink and an aqua NY Bright. I love them. They are easy to tie and can go with almost anything. They were part of my start-up when I began wrapping. I love my green NYB! It is majorly versatile, and makes my other tichels pop! They are very soft, and have lots of potential for awesome wraps! 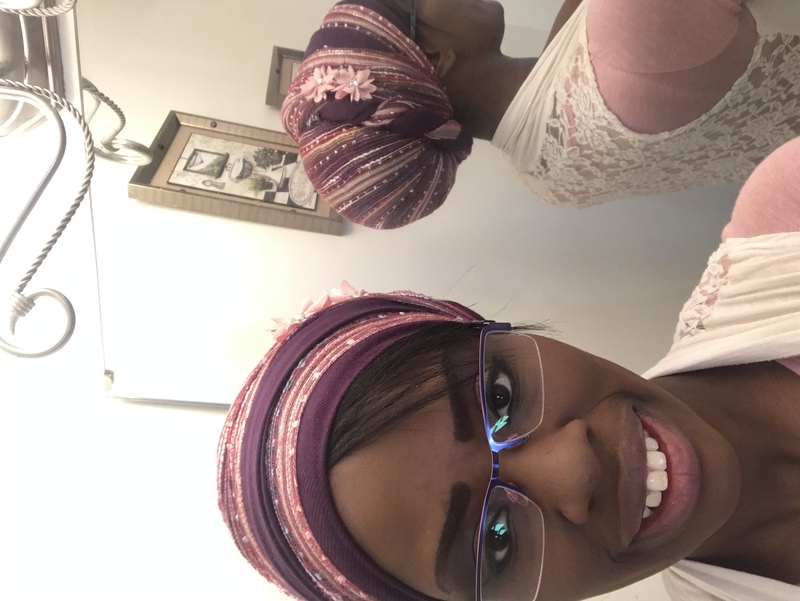 I just love these scarves – plain on their own or paired up with the 2in1s. They add colour, life, and texture to any tichel match. I have to get more of them – they are a true delight to work with! Either they add a beautiful contrast or enhance the colour you wear if you match them tone in tone. True beauties! My NY Bright scarves have become my go-to favorites. They are so colorful that one or another will dress up any outfit I put together, and I am guaranteed compliments whenever I wear one. Just one will go a long way in one’s tichel wardrobe. These are so beautiful. Too hard to choose just one; I’ve been wearing more than one at a time! Really easy to handle. Textured, but they don’t look or feel rough. The name fits these New York Brights! I simply love mine. 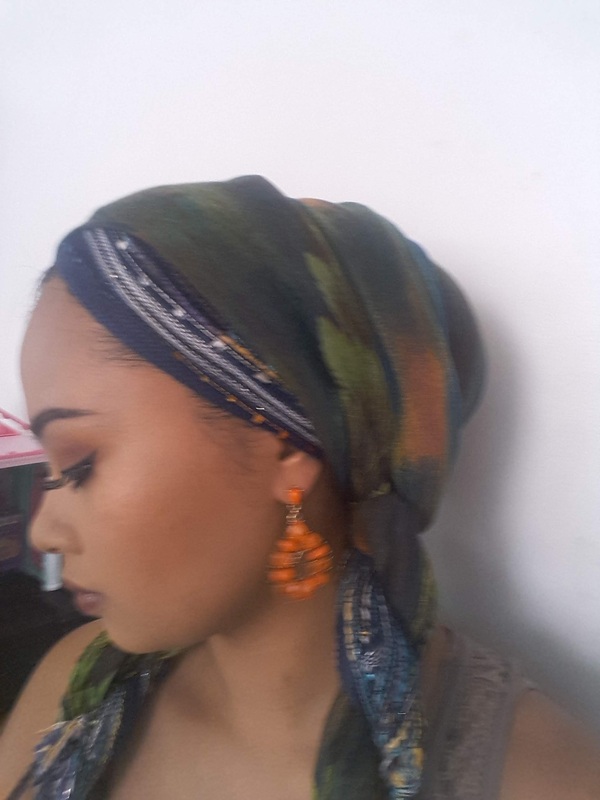 I have orange and green and they work well with most any pashmina. They are lightweight and very versatile. 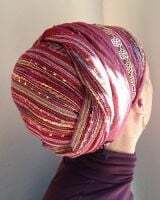 You can use them as a sash or a full cover over your pashmina. They are great for everyday wear.